This little pal can be left open to hold your yarn and threadscraps until you can dispose of them however you wish, ORhe or she can be finished off to be a new friend for you or a gift. You will be working in one continuous round with no join. Row 1; chain 2, 6 single crochet in 2nd chain. Row 2- ? 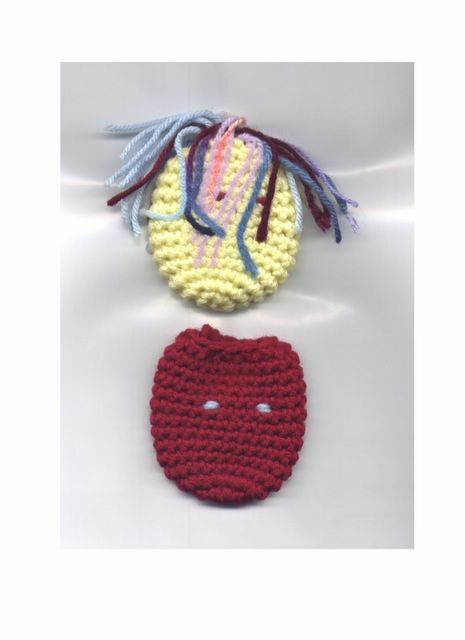 ; 2 single crochet in each stitch until you have a total of 24 single crochet. Sew eyes between rounds 6 & 7 of the ten even rounds,with 2-3 stitches between them. Single crochet 2 together around until there are 12 stitchesremaining. End by slip stitching into the front loop of the next stitch.When you cut the yarn leave it long enough to be part ofthe "hair. Tie "hair to the front loops of the last round. When you little friend is full enough if you want a toy or palto give, thread a good length of yarn through the back loopsof the last round. Pull tight. There is a small gap remaining,just pull it shut with this same yarn and tie in a knot. Trim your new friends "hair".